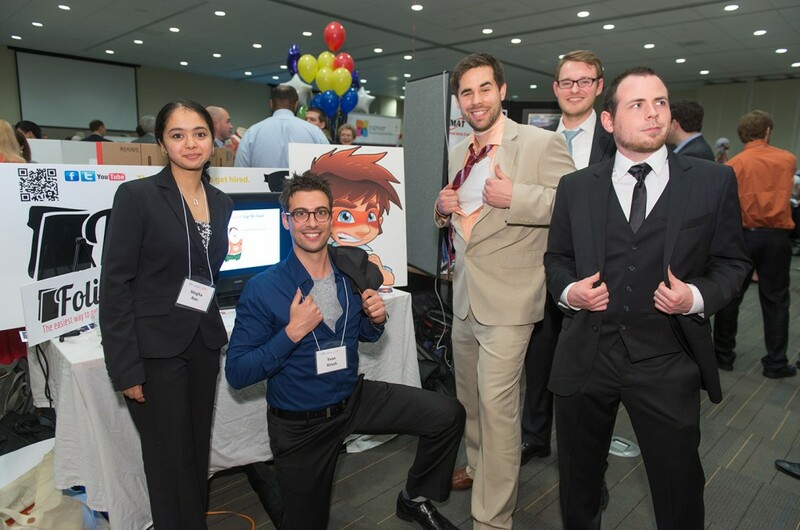 Big Winners at the Regnier Venture Creation Challenge! 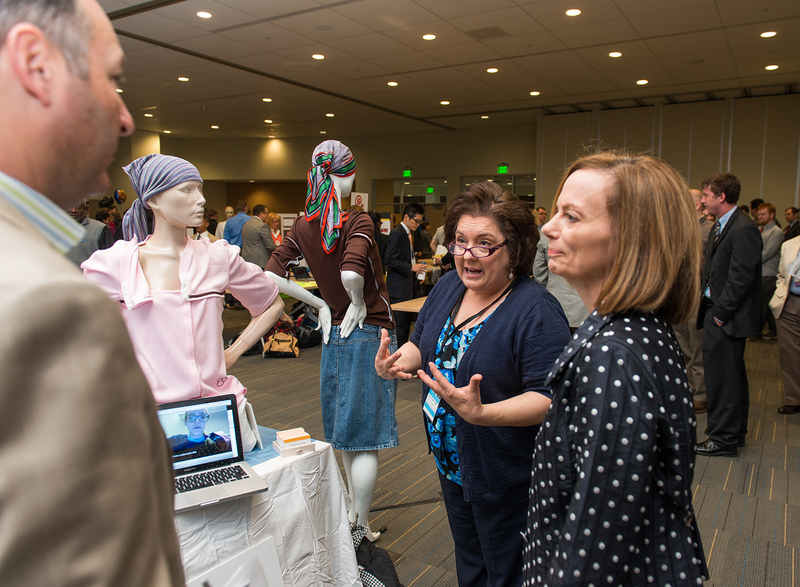 A mother inspired, through the pain of losing a child, to create street-like clothing with safer, better functionality for those who are chronically ill and hospitalized. A Federal Reserve employee who believes there’s a better way for people to connect with volunteer opportunities in their communities. An urgent care section chief at Kansas City’s leading children’s hospital who is determined to save people unnecessary trips to the ER. 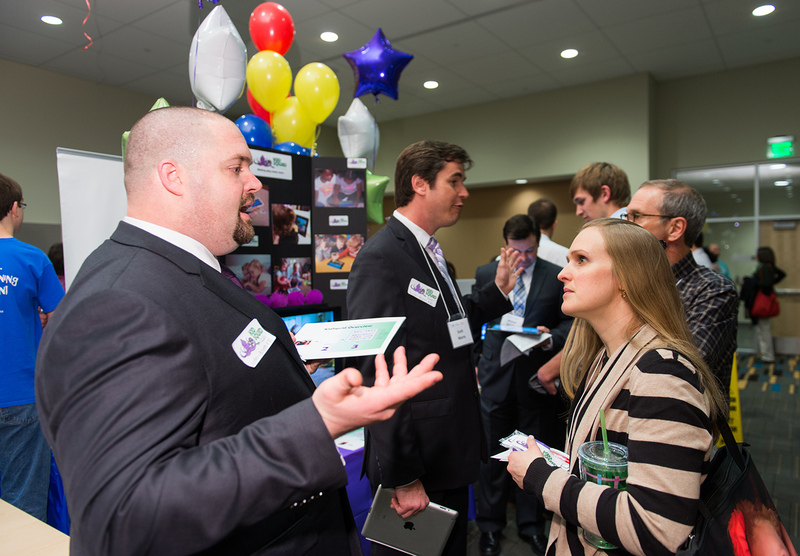 These are just a few of the inspirational stories that inspired judges at the 2013 Regnier Venture Creation Challenge held on Saturday, April 27 from 8 a.m. to 6 p.m. in the UMKC Student Union. This year, 68 cross-disciplinary student teams participate (of 129 teams who entered). More than 120 judges (business and community leaders, entrepreneurs, investors and mentors) have or will participate in three stages of the competition: business plan evaluation; venture expo judging and investment; and finalist presentations. A total of 25 winners, including special awards and awards with distinction, were announced on Saturday. These winners will be invited to return in the fall to compete for $5,000 in seed money (per venture) and a spot in the Institute’s Venture Accelerator, an incubator-like set up for ventures with high possibility for rapid success. The Venture Accelerators will office in the new Henry W. Bloch Executive Hall for Entrepreneurship and Innovation, opening this fall. Outstanding Elevator Pitch: Recognizes the team with the best elevator pitch at the start of the day. Millions of parents are challenged with the process of weaning their children from their pacifiers. Bye Bye Binky is a transitional pacifier system consisting of three BPA free silicone pacifiers enclosed in a sterilizer case. As surface area reduces with each stage, maintaining suction becomes more difficult and slowly diminishes the satisfaction received from pacifier use. Outstanding Founding Team Award: Recognizes the team that is particularly well-suited to their venture. 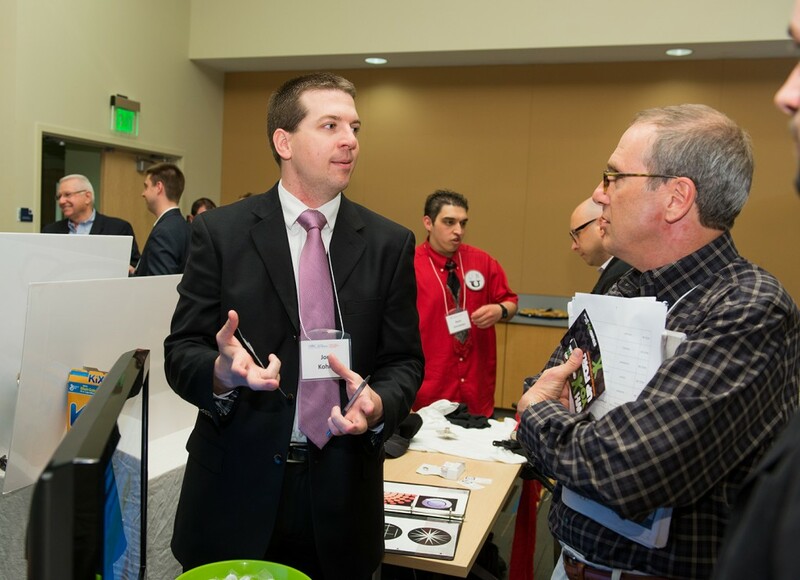 Bloch School EScholar Jon Kohrs talks to venture judge Tom Bloch about Stand Up for Good, a socially entrepreneurial venture that connects people who want to make a difference with the causes and organizations that need them. Central to America’s fabric is our ability to join together with each other, our neighbors and our community when others need help. However, there are two major problems in the market. First, the supply of volunteer capital is not maximized given a lack of strong social support networks to encourage participation. Second, groups that demand volunteers can’t immediately measure their engagement, influence or contributions. SU4G’s mission is to revitalize community through collisions of social good. We use technology to put the power of doing good back in the hands of community. Innovative Business Model Award: Recognizes the most innovative model of sustainable business. challenges in the Residential Service Contractor Industry. Service companies can sign up and immediately start entering their customer and inventory data. Shamerrific provides an environmentally compliant way to wash and detail cars. To date, they have washed and detailed over 500,000 vehicles using the Shamerrific®. Lot washing provides on time scheduled washing and abiding by the Clean Water Act, not using chemicals like other competitors. Detailing is fast and efficient, allowing our staff to find out consumer’s individual needs. Karen Cox, Executive Vice President and Co-COO of Children’s Mercy Hospital helps AudreySpirit founder Donna Yadrich explain her clothing to judges. xamtee™ and empowertee™ therapeutic garments are designed, manufactured and distributed by AudreySpirit, LLC. These garments are both hospital friendly and indistinguishable from street clothes. They feature innovative fasteners that allow for the connection of monitoring tubes and lines without interruption. This assists caregivers by reducing the risk of bloodstream infection, which patients routinely face, by reducing the need to remove tubing and lines whenever a patient needs to undress. xamtee™ apparel also decreases caregiver time, reduces risk of hospital-acquired complications and costs and improves the patient experience. RFP stands for Request-for-Proposal and is a term referring to the standard business of requesting a sales proposal from a potential vendor. RFP365 is a web-based platform designed to facilitate the entire Request-for-Proposal (RFP) process. The application benefits both issuers and responders with time saving features, configurable workflow, and insightful analytics. RFP365 provides procurement and business development teams real-time reporting and knowledge management features in a collaborative environment. A web-based application that allows any number of hospitals to tie their materials management systems together, thereby gaining the bargaining power of one enormous hospital. With multiple hospitals buying together using unprecedented informatics, they can commit to vastly larger purchase amounts, over longer time spans. And with locked-in market share and revenue from said orders, suppliers can finally feel safe in offering best pricing. 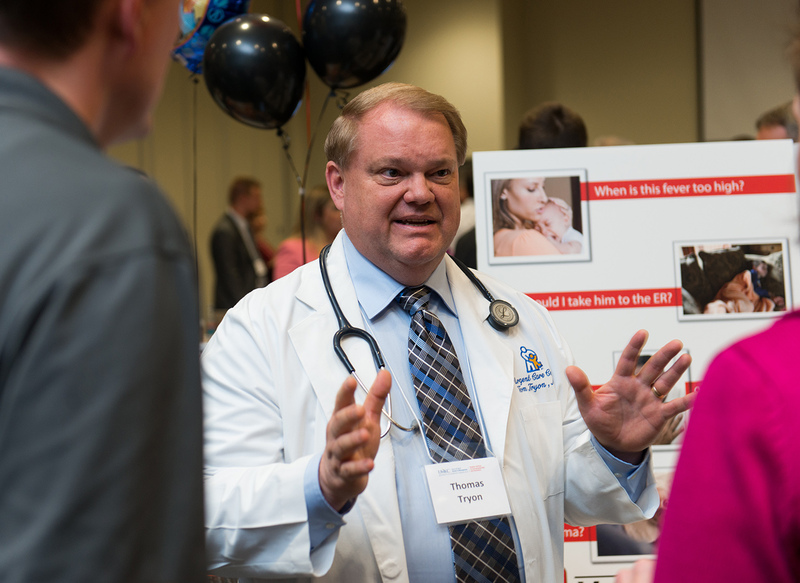 Bloch Executive MBA Tom Tryon (section chief of urgent care at Children’s Mercy Hospital) explains to judges how to cut ER visits using MyHealthAdvisor. MyHealthAdvisor is a web-based, rule-based software application containing the top 600 health concerns. It will provide consumers with a step-by-step reference guide to assist them in determining if their condition needs emergency care, urgent care in a physician office or ambulatory clinic or can be reasonably managed at home. In the hands of consumers then empowered to make educated and accurate healthcare decisions, MyHealthAdvisor will create significant cost savings for public and private health insurance companies, corporations, accountable care organizations and consumers. The Folioboy team poses for a portfolio picture during the Expo. Folioboy enables students to create online portfolios, publish them, and then share them with colleges and employers. Folioboy offers a free service as well as a premium service which starts at $30. The focus of the company is to partner with colleges, which will be the real vehicle for profit. Folioboy is already in the process of partnering with other collegiate organizations and services for marketing among universities. Envy Gaming, LLC, “Envy Gaming Gear” hand-tailors gaming products that are already manufactured in the video game market. Envy takes the gaming products that the masses already use, and adds the ability to individualize the design. Envy’s focus is on adding cosmetic changes to existing products in the market to help gamers individualize and express themselves. Tappecue is the future of thermometers used by the meat smoking hobbyists who need freedom from the smoke of their smokers yet still need constant monitoring or alerts. Unlike Bluetooth and radio frequency devices that limit the distance you can roam, Tappecue offers no limitations, which provides customers with freedom to work on home projects, get last minute supplies at the grocery store, or play a game of golf without worry. Dycon Productions, LLC is a new entertainment company in Kansas City that specializes in bringing women’s entertainment to the Midwest. The company will produce music concerts, comedy shows, conventions, parties and other festival and family fun events that feature women entertainers and icons. Cyument Low-Exotherm Bone Cement is an epoxy compound that anchors artificial joints, such as hips or knees. Unlike other bone cements, Cyument cures at a low temperature and avoids damaging human tissue and imbedded antibiotics, which is a common problem with existing products on the market today. “Bridge scour” is the erosion of sediment such as sand and rocks from around bridge abutments or piers. Smart Rocks provides scour mitigation in safer manner at a lower cost to manufacture and provide real- time monitoring as a preventative maintenance against bridge scour. Most hospitals rely on HCAHPS (patient satisfaction data mandated by the federal government) or other types of survey data to monitor patient experiences. Few hospitals have access to the type of patient feedback they need to diagnose and fix the problems that lead to dissatisfied patients. PatientsVoices™ provides specific, actionable patient feedback that allows hospitals to improve their patient satisfaction ratings, optimize Medicare payments and retain valuable patients. 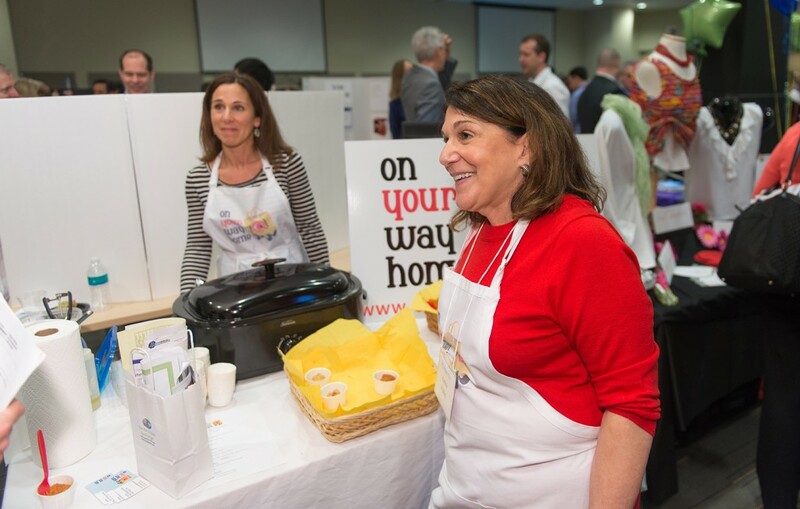 Kathy Mohn tries to keep up with supply and demand as she demonstrates that you can conveniently pick up her homestyle meals “on the way home”. What’s for dinner? Clients can order and pay for a well-balanced dinner by phone, online, on Facebook or via mobile app…then pick it up at the time of their choice on their way home. Dinner is delivered right to the car door, healthier than fast food and faster than a restaurant. Mark Medical, Inc. ensures that older adults and individuals with chronic disease can remain living at home (“Age in Place”) and receive the appropriate care reduces the need for older adults to move to more intensive, high-cost care settings. 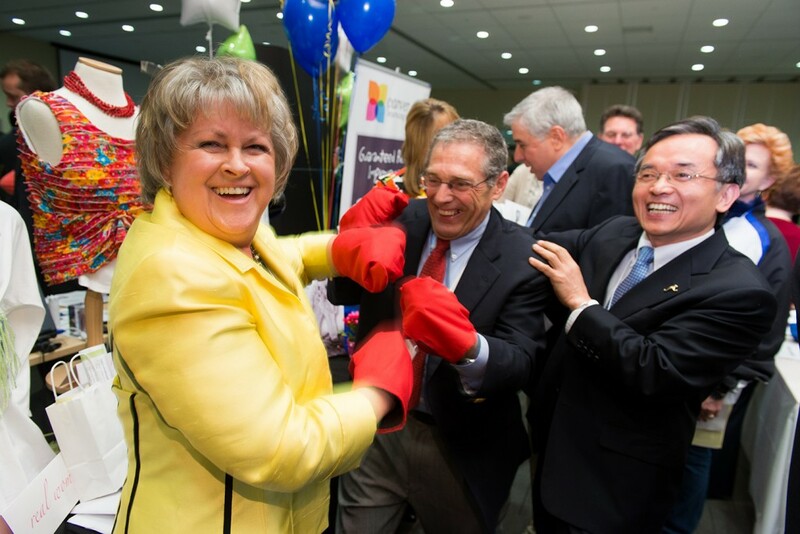 Judy and Joe Roetheli, venture judges, show off their boxing skills to Regnier Institute Executive Director Michael Song using products developed by Jeanette Knittel Apparel. Designed for women who want feminine, classic, comfortable and sophisticated clothes that balance career and casual with challenges of hormonal fluctuations that cause hot flashes and night sweats. Proactive fabric technology adapts and changes based on body temperature, managing heat to reduce overheating and perspiration. Bloch Executive MBA Justin Guggenmos explains the technology behind children’s learning assessment tool KidSquid. Online service focused on learning and assessment of play. Children (aged 3-6) are often playing with educational toys and applications but there is no way for parents to know how well their child is developing key skills. KidSquid can map the results, provide suggestions for developmental areas of focus and inform you where your child falls among their peers. Creating a nationwide chain of adult-centered soccer facilities and striving to become synonymous with 5-a-side soccer in the United States. The first facilities are slated for the Midwest, starting in the Kansas City area. A patented fastening hardware system with product currently available for sale. SECURZ-IT offers a simpler and more secure solution than what is offered in the market today in two products: the Wall Mount Fastening System, museum quality solution that securely mounts framed art, video screens, and other items to wall and the Furniture Fastening System, an easy-to-install method to repair broken furniture and assemble new flat-packed furniture. Media requests should go to Victoria Prater, 816-235-5295. The Regnier Institute for Entrepreneurship and Innovation at the UMKC Bloch School inspires and nurtures future generations of entrepreneurs, and delivers transformational entrepreneurship education and experiences university-wide. The Henry W. Bloch School of Management strives to be Kansas City’s nationally and globally preeminent school of management focusing on entrepreneurial and innovative thinking as the foundation for transforming talent and achieving sustainable growth in for-profit, public and nonprofit enterprises.